The leader of Portsmouth City Council's Labour group has resigned from the party following Jeremy Corbyn's re-election. John Ferrett had been a member of the party for 27 years and stood in general elections in 2010 and 2015. He said the party under Mr Corbyn had become a "protest movement that has no interest in winning power". Mr Corbyn appealed for unity after being re-elected as Labour leader, defeating challenger Owen Smith. 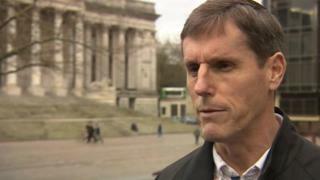 Labour was in control of Portsmouth City Council in the late 1990s, but Mr Ferrett had led a group which had fallen to just three by the elections of 2014. "Labour traditionally has had fairly strong base in Portsmouth but the last five years, even under Ed Miliband, it's been really really hard to establish Labour as a credible party and now under Jeremy Corbyn we'd find it almost impossible to win in places like Portsmouth." Mr Ferrett called on members of the Parliamentary Labour Party to create a new political party as a "reasoned social democratic alternative" to the Conservative government. He said he would continue as an independent councillor and consult residents in his Paulsgrove Ward. Mr Corbyn secured 61.8% of the vote to comfortably defeat his challenger Owen Smith in the leadership election. Among those calling for party unity, Shadow Foreign Secretary Emily Thornberry said it was time for opponents of Mr Corbyn to fall in line, telling the BBC News Channel they needed to work for the "greater good" by providing a strong opposition. In a statement, Portsmouth Labour Party's co-chair Sion Reynolds said party members were "disappointed" at Mr Ferrett's resignation. He called on him to resign his council seat to allow Paulsgrove residents to "have their say" on his decision in a by-election.